Hi-- embarrassing question. 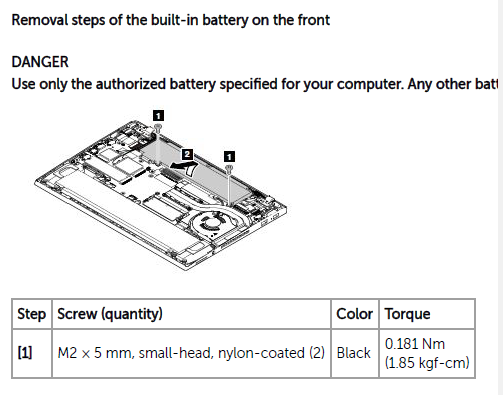 I am trying to replace one of the batteries inside my T460s. However, my Phillips head screwdriver is too pointy, so the blades don't grip the screw . What are the exact specs of screwdriver I need? Wiha or Wera tools are excellent. It's a JIS type S screwdriver, similar to a Phillips, but a little different. That's where I shop for electronics tools. You might get away with a flat-head screwdriver for that, but check that it fits the cross slot precisely before applying any torque. very very helpful. I never knew screwdrivers had such a rich specification matrix. Learning even more via this excellent forum! The same goes for gunsmithing screwdrivers too. They are very precise to fit certain screws.